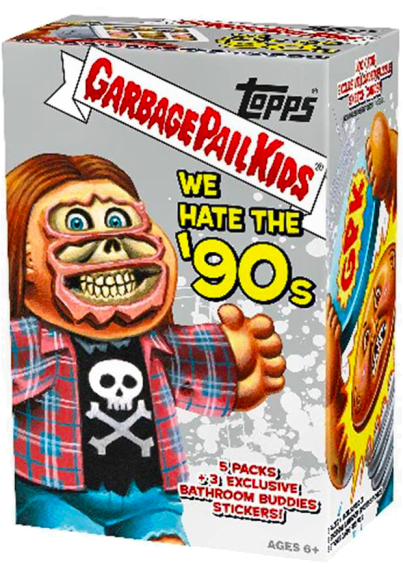 The semi-nostalgic "We Hate the 90s" 2019S1 GPK set announcement was released by the Topps Company, Inc. on Wednesday September 12, 2018 with hobby electronic sell sheets breaking down the source material with mock-up promotional images and retail sheets following close behind on September 14th. 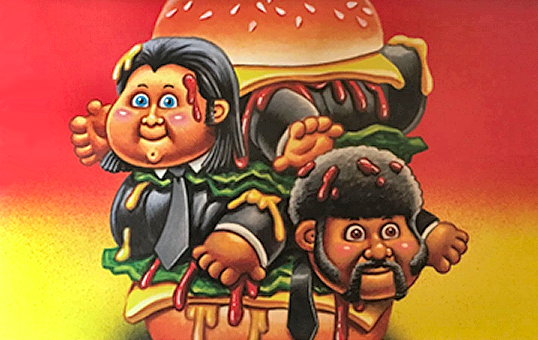 The wacky and wistful parody set was scheduled to be released on Wednesday, January 16, 2019 and stated that "the Garbage Pail Kids 'We Hate the 90s' edition features all-new art, parodying cartoons, toys, TV, films, video games, fashion and more, broken down into genre-specific subsets". 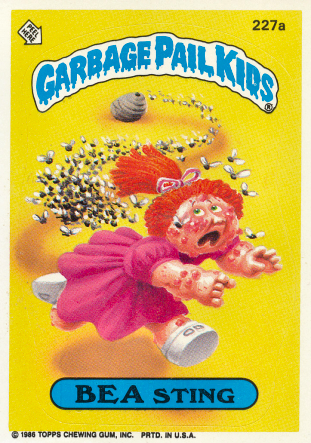 The GPK series includes all-new artwork and contributions by artists Brent Engstrom, Joe Simko, David Gross, Layron DeJarnette, Fred Wheaton, Miran Kim, Neil Camera, Smokin' Joe McWilliams, JungHwa Im, Colin Walton (editor, art director, writer) and Mark Von Ohlen (brand manager); along with original series artwork by veteran artists John Pound and Tom Bunk. 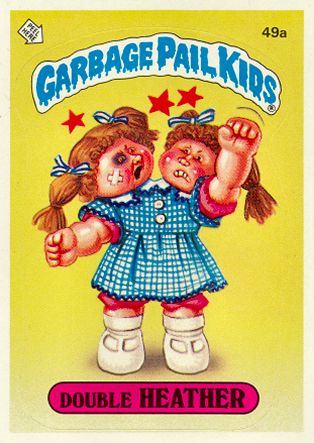 Most individuals involved submitted their own concepts and nomenclature, otherwise Topps attempted with their own efforts; this set would mark the last set that art director Colin Walton would almost complete before leaving Topps and the first retail set that stand-in art director Jessica Kanzer would take over. 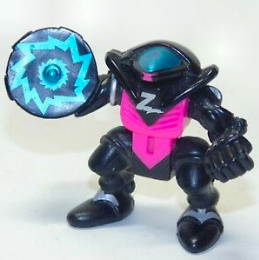 This release also marks the first set to have all-new material represented on the packaging without using original-series characters. and the last installment of the 90s Bathroom Buddies. 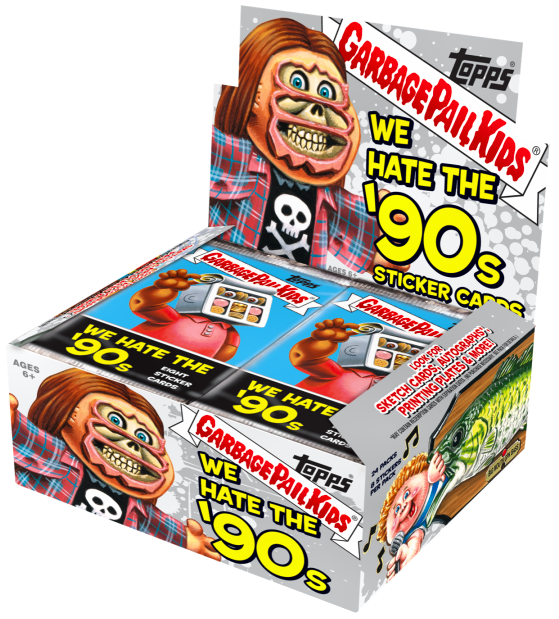 For the first print run, each foil or plastic pack (with a suggested retail price of $1.99) contains eight sticker cards, except for the Hobby Collector Edition box with exclusive premium content packs that contain eight stickers per pack or may contain seven stickers per pack with a special insert. The artists were requested by Topps to start submitting concepts in early May while approvals and production of the artwork ran through July. Art director Colin Walton had artist Brent Engstrom complete nine of his approved 90s concepts early, in the middle of production of the 2018S2 Horror-ible paintings, in order to have finished artwork ready for the product release sheets. 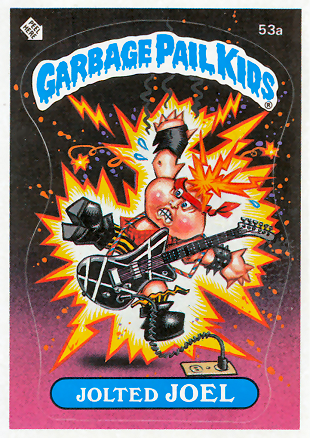 The nine images were: 'torn jeans'; used for a sell sheet promo card image, as the main artwork for the hobby display box and hobby collector wrapper image, and the retail display and blaster boxes, 'pocket pet'; used for a sell sheet promo card image, 'prepackaged lunch'; used for a sell sheet promo card image and as the hobby display and retail (display, blaster and fat pack) images, 'royale with cheese' used for a sell sheet promo card image and the hobby collector inlay image, 'pog slammer' used for a sell sheet promo card image and side box artwork, 'hip sack'; not used, 'pin art'; not used, 'mortal combat'; not used, and 'barfing terminator'; used for a sell sheet promo card image and as the main artwork for the hobby collector box. def'n: HATE - to feel intense or passionate dislike for something. 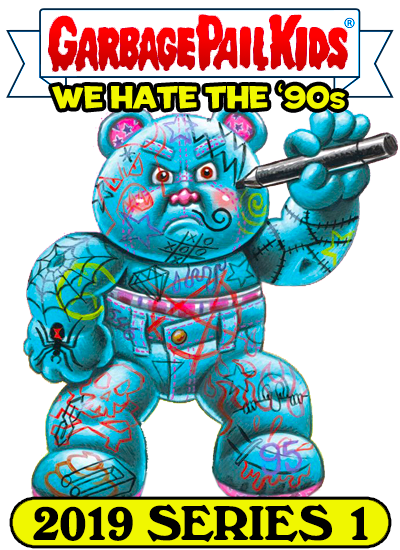 def'n: '90s - is an abbreviation for "The Nineties" or "1990s" decade. Notice: Target Gravity Feed boxes cancelled as of September 2018. CASE (PKG007959)(FGC003270)(UPC 8-87521-07746-5) : 16/5+3 COUNT? 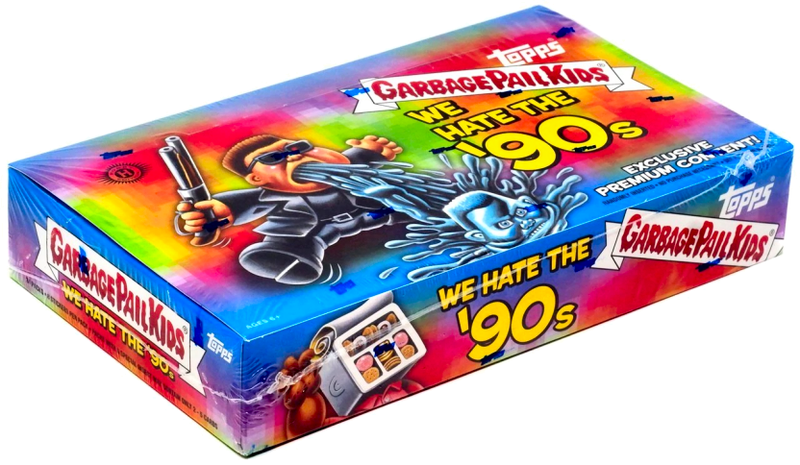 The 2019S1 'We Hate the 90s' release is the eighteenth GPK set to contain Sketch Cards numbering 1/1 (one-of-a-kind) found within hobby boxes or retail boxes. Standard sketch cards (hobby + retail box ), Die-cut shaped sketch cards (hobby collector exclusive), 'folded' Panoramic sketch cards (one artist; retail value fat pack exclusive), 'folded' Triptych [replaces 'dual' Panoramic] sketch cards (hobby collector exclusive) and Loaded sketch cards (four Standard sketch cards; value blaster box exclusive). 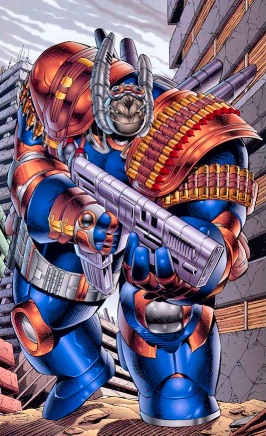 '90s Cartoons & Comics subset cards 10a Extreme- LEE and 10b Nineties Com-MICK, painted by artist JungHwa Im, takes its source material from Rob Liefeld's Badrock character from the Youngblood comic book series. 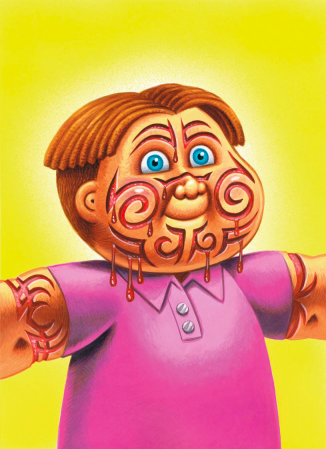 Artist Brent Engstrom found it easier to paint the entire Kid first, then 'carve out' and paint over the inkless tattooing for the '90s Fads subset character for cards 9a Tribal TAD and 9b MATT Tats. 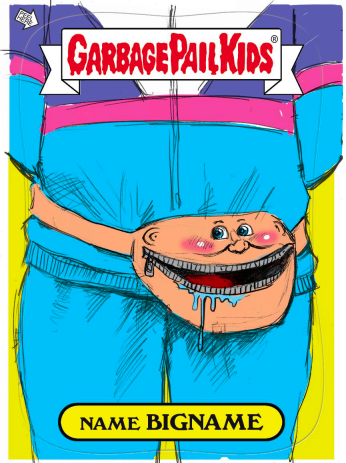 aka Hip Packs, Bum Bags, etc. 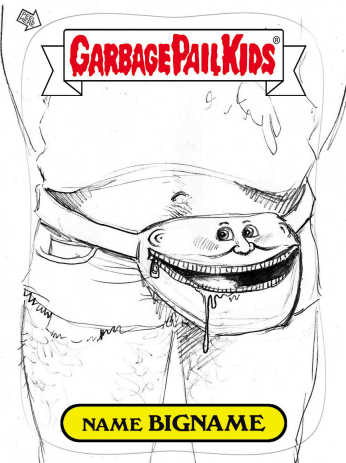 aka Dungarees, Bib Overalls, etc. 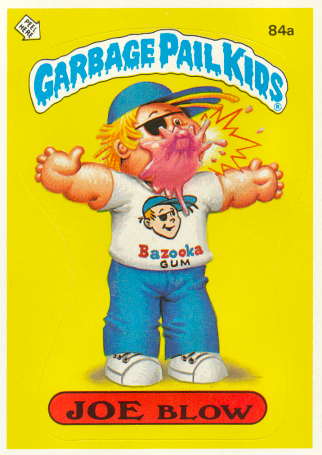 Artist Brent Engstrom revised the concept for the '90s Fashion subset character for cards 1a Fanny JACK and 1b ANNIE Pack, changing the male character with cut-off denin shorts and cropped shirt for a femle with a neon track suit. 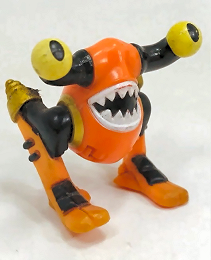 Originally submitted as a 'Fad' entry. 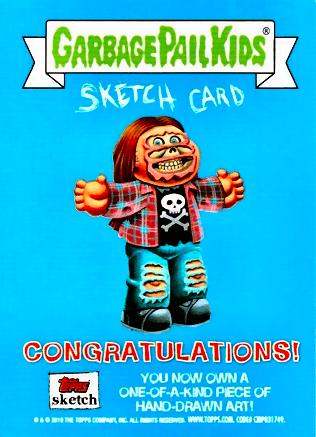 '90s Fashion subset cards 10a Extreme- LEE and 10b Nineties Com-MICK, traced and painted by artist JungHwa Im, takes its original source pose, sans gum, from GPK OS3 cards 84a JOE Blow and 84b ROD Wad painted by artist John Pound. 18a WHIT'S IN THE BOX? 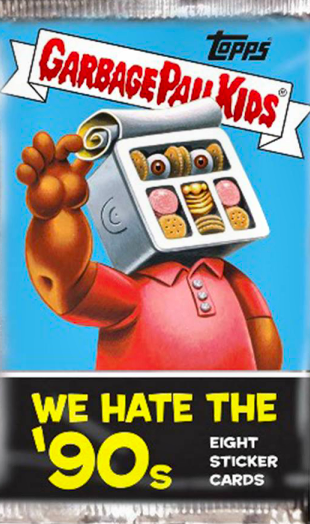 '90s Films subset cards 18a WHIT's In The Box? 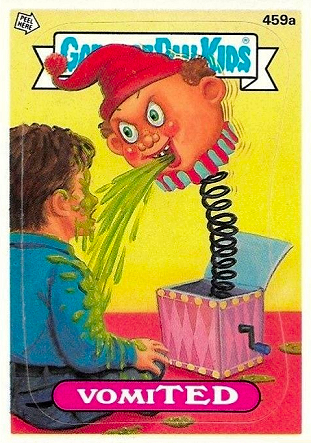 and 18b Se7en DEVIN, traced and painted by artist JungHwa Im, takes its original source material from GPK OS11 cards 459a VomiTED and 459b Juicy JULES (same nomenclature used on card 14a) painted by artist James Warhola. 'Ginger Spice'; Geri Halliwell, etc. 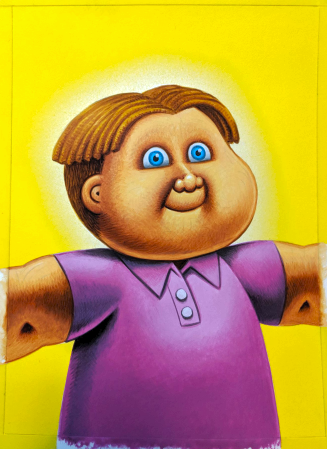 '90s Music & Celebrities subset cards 4a Blind MELANIE and 4b No RAINE, painted by artist Joe Simko, takes its original source material from GPK OS6 cards 227a BEA Sting and 227b Screaming MIMI painted by artist John Pound. James Danforth Quayle; Former V.P. aka Milk Caps, Bottle Caps, etc. 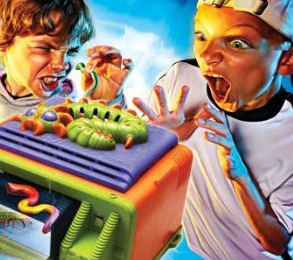 '90s Toys subset original source material for GPK cards 4a ZVEE Bot and 4b Void BOYD, painted by artist JungHwa Im, used Z-Bots Burger King promotional toys 'Jawbreaker' and/eating 'Buzzsaw' and the Creepy Crawlers Oven box artwork for cards 6a Creepy CARL and 6b Crawlin' CAL. 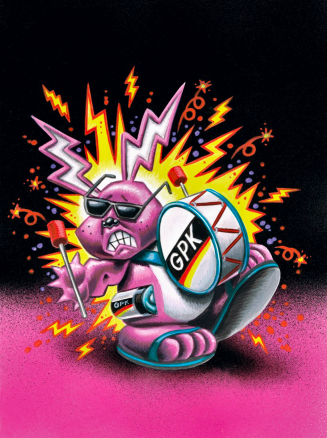 Timothy Taylor + Wilson W. Wilson, Jr.
'90s TV subset original source material of OS2 cards 53a Jolted JOEL and 53b Live MIKE, painted by artist John Pound, uses the same environment treatment for GPK cards 20a Energized EDISON and 20b BONNIE Bunny painted by artist Brent Engstrom to great effect. 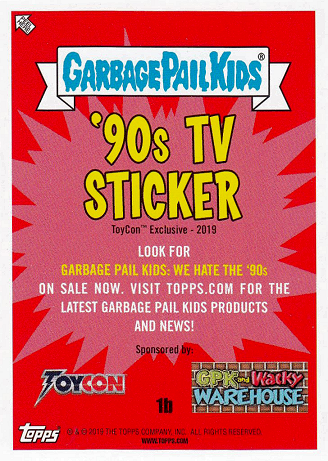 Topps presented a TV subset promo card set for the March 1st-3rd ToyCon weekend, acknowledging the GCC for the first time in 2019 to promote their own brand; the card was sponsored by the ToyCon and sponsored and printed by GPK and Wacky Warehouse; who has printed all of the GCC promo cards to date. 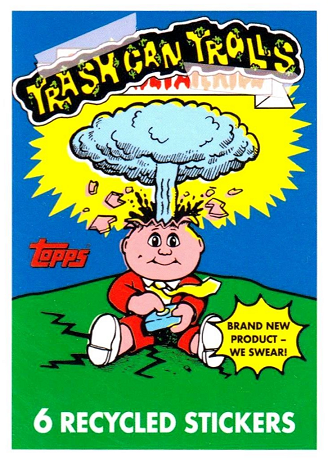 '90s Wax Pack Parodies subset cards #5 Trash Can Trolls contains original series rendered wrapper artwork by artist Tom Bunk of the infamous ADAM Bomb character used for the OS1 thru OS5 wrapper images; the GPK has been placed on a replication of the TCT wrapper and dressed in his rarer red suit. 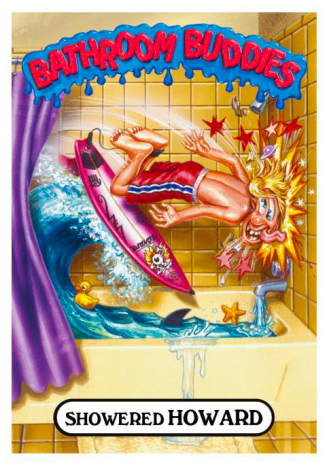 The 'Bathroom Buddies' exclusive blaster box set contains original series 2 unpublished artwork by artist John Pound who completed three images for the previously unreleased set that was shelved in the '90s. This will most likely be the last Bathroom Buddies installment for the Yearly sets.